John and I are all about the date nights and we have one coming up at the Vancouver Christmas Market. We’ll shop for some hand-crafted gifts, perhaps pick up a stein, listen to live music, and enjoy the twinkle of the lights with snow-capped mountains as a backdrop. 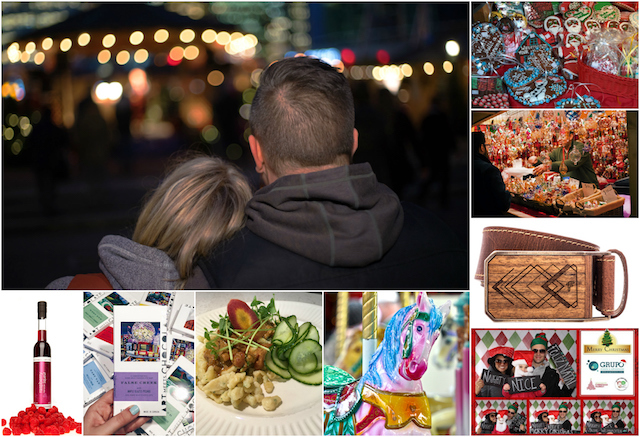 Sharing some of the love this season, the Vancouver Christmas Market and its vendors have put together an ultimate date night prize package for a lucky Miss604 reader to enjoy. Prizes may not be exactly as shown in this collage. Authentic German Spätzle Dinner for 2 from Captain and the Chef Spätzle Haus. Spend a romantic evening at the Vancouver Christmas Market dining on an authentic, hand-made, Spätzle Dinner for 2 (egg noodles) with one of 3 toppings, and gurkensalat (German cucumber salad). Enjoy your choice of traditional cheese and caramelized onions; wild mushroom cream sauce, or their dairy free fusion of inspired coconut curry tomato sauce. This delicious meal also comes with a pair of sparkling beverages. 1 Vintage Brown Genuine Leather Belt with a Wood Inlaid Buckle from the Mistura & Fento Hut. This is just a glimpse into the craftsmanship of the fine products offered by Mistura & Fento including wooden watches and sunglasses, leather belts, wallets, and bracelets. 1 Bottle of Raspberry Liqueur from Okanagan Spirits Craft Distillery Hut. I will draw one winner at 9:00am on Friday, December 16, 2016. The prize package will be waiting at the Vancouver Christmas Market on Friday morning so that the winner can attend the market during the weekend before Christmas. The market is open through to December 30th (closed on Christmas Day) at Jack Poole Plaza (Vancouver Convention Centre West). Follow along on Facebook and Twitter for more information this season. Update The winner is Eran! What a way to spend the eveing with the one you love in a beautiful setting. Vancouver at it’s best. This sounds like a fun date night. Havent gone to this yet! Would love to go! My husband is a high school teacher and tutors after work. I’m a nurse and work shift work. We haven’t had that much time this year to do fun holiday events yet. This would be such a treat for the both of us to spend quality time and enjoy the festive spirit. My partner and I have been planning to go to the Christmas Market, and this would be the perfect date! Love going to Christmas Markets! Went last year — lots of fun. My wife and I just lost our dog of 15 years. I could really need this to pick ourselves up a bit. I would love to go with my hubby. Please enyer my name ? Love it!! I would love to go!! Please count me in, this is a perfect date night for my wife and I! I would love to have a date with my wife!!!! This sounds like such a fun evening! Sounds like a wonderful Christmas date night!! I have never been to the Chistmas market. This prize pack would be perfect! I LOVE the Christmas market. Every year! Havent ventured there yet this season. I’d love to take my wife if I won! It would be such a treat to go on a date night with my hubby!! Woot woot! Date night.. love these contests!! Thanks! Sounds exciting! The Christmas Market is always great fun! Overdue for a date night – would be great to win this! would love to win this awesome Christmas Market prize! Would love this prize for a date night! Sounds like a perfect date night. Thanks! Thanks for the chance to win this amazing date package. I’ve heard the new location for the market gives it more space – would be great to visit! Excellent date night; Merry christmas to whomever wins! Nothing says date night like Spätzle. ? This sounds great! Just in time for our anniversary too. Such a fun prize! Thanks! Ahhh, would love it! ? Yes, please. That would be amazing! My hubby and I are in desperate need of a date night. This would be great on these cold Vancouver nights! thanks for posting! Sounds like a perfect date night! Would love to win this great prize! ? all the fun! this sounds like the ultimate dream Christmas date! First Christmas in Canada – I’d love to go! Did the things! @rachetgrrl on Twitter. Pick me! Pick me! ? Love to go on a datenight with my overworked hubby. We would love to go! Sounds like a great Christmas spirit generator. Would love to see the Christmas market! That sounds like a great date night! I think i am the only single commenting here… and may be this ticket will bring also a dating to me!!! Yes, please. Would love to go! Great prize for the Mrs. This is an amazing Christmas event. A break is just what we need!! This would be a great Xmas gift. Thanks! Lovely gift! Would love to go! This would be such a great night for my husband and I! This would be a great date night! what a great idea! thanks for the chance. My hubby and I are planning to go but your prize package would be make it super awesome! I would love to check out the new site for the Market this year…fingers crossed. What a great prize package! We go every year. This would be a great prize. This would be my first time going! Sounds fun! My wife will be thrilled if I win this prize…she would really like to see the new location for the Market. Nice prize package! I would love to gift this to my parents who deserve a date night after 50+ years of marriage! Best contests and opportunities, ever! My hunny and I would love this!! What an amazing date night package!!! Fingers crossed! This would be awesome! ??? This sounds like a wonderful thing to do at Christmas time. Nice prize! Would love to visit the market again! Intended to go on Friday! What a date this will be! Want to take my better half! I am eager to go there! Would love to partake in all of those prizes! Great giveaway! I’d love to take my wife to the Market. Haven’t been to the new one yet! 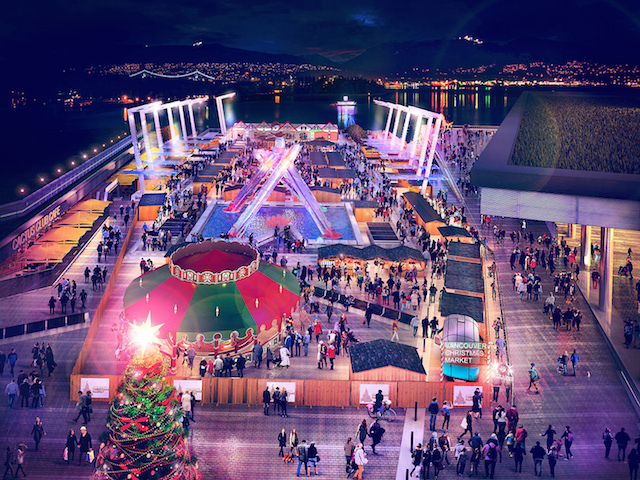 Would love to see the Vancouver Christmas market in its new location! The authentic German dinner sounds amazing,what a great date night! Would love to take my fiancee! She loves it here and we haven’t had a chance to go this year yet. Looking forward to this. Have never been! This sounds like SUCH a fun experience! Thanks for the opportunity 🙂 Merry Christmas! This sounds like the perfect holiday date! Looks like it would be fun for all ages! Holy ?!! I would get so many husband-points with this especially after being down with a cold the last few days. Apparently, my snoring ? defeated the earplugs & someone hit the couch. I’m in deep d’oh now…. Love going to the Christmas market!! I would love to win and go on a date night with my wife. The market would be so magical with it being so close to Christmas. This would be an awesome night out during the holidays with the husband ! Great place to spend Xmas! This would be so wonderful! With my birthday coming up this would be a great night out!